I worked closely with the editor to develop a dynamic layout including callout boxes and infographics that I created. Imagery was challenging because the building is still under construction, but I used renderings to show the finished product and photos of the planning process to add a human element. I worked with one of the winning dentists and a photographer to create an approachable cover photo. I also collaborated with an illustrator for the opener image and designed the layout for this issue. I designed a cohesive look throughout this feature's many sections. I pulled certain paragraphs from the main stories and expanded them into graphic elements for a more interesting layout. 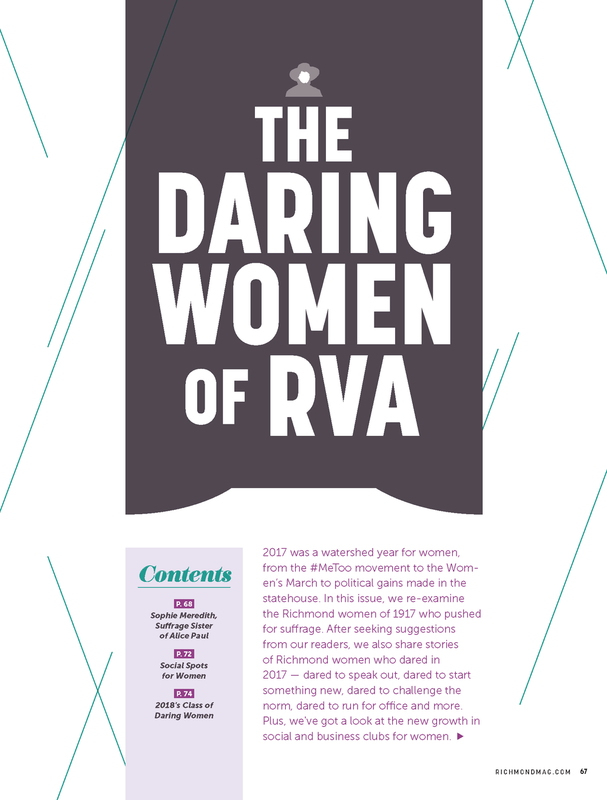 This feature consisted of three different stories: Sophie Meredith's suffrage history, past and present women's spaces, and profiles of notable women in Richmond. I created a cohesive design scheme that carried throughout and was also used by the creative director on the cover. I used Photoshop to create a unique hand drawn look for the images of the profiled women. I incorporated my own hand lettering throughout this issue to tie the stories together. This feature had several long sidebars to incorporate with the main story. I used color to separate blocks of text so the reader can easily distinguish the different sections. I also worked with the editor to visually interpret some of the facts and figures from the story into an infographic. The food editor and I worked together to create an entire issue centered around one theme. I carried colors and typefaces throughout to unify everything. I also illustrated the "Weird Science" tongue infographic. After seeing the story, the editor and I decided on a "survival guide" look full of highlighters, sticky notes, etc. I communicated often with the illustrator to incorporate spot illustrations into the design. I came up with a light-hearted design for what could have been a boring feature full of charts. I paid close attention to organizing and highlighting content to help the reader sort through all of the information. I incorporated elements from the creative director's cover concept (the small doodles and the "Top High Schools" title text). I created a fresh design for this annual publication around the idea of a pile of presents.